There are those of us who get discouraged when we are in a church that does not have the resources to produce the kind of youth ministry we want to have. This lack of resource may come in the form or money, people, or facilities. I struggle with not being optimum. Optimum – most conducive to a favorable outcome; best. I know that if I just had x we would have tons of kids, etc. 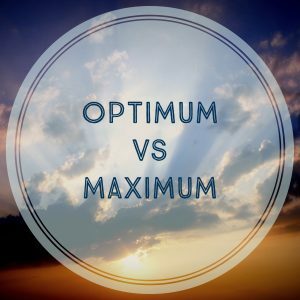 Maximum – as great, high, or intense as possible or permitted. is using what we and who we are to make disciples, reach kids, have worship, etc. David was not optimum, but he was maximum through his faith in God. Jesus had 12 raggedy guys, not optimum, but they were maximum through the Spirit. If you are struggling because you think optimum (best leaders, more money, etc.) is the only way to do God’s work, consider passionately praying and doing your best with what you have and let God handle the maximum. What is not optimum in your your youth ministry right now? How can you turn that into maximum?